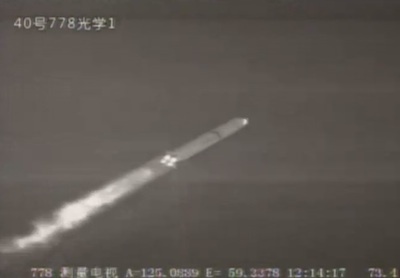 A Chinese Long March rocket blasted off from a remote desert launch base Friday with a high-resolution Earth imaging payload and Ecuador's first satellite. The Long March 2D rocket fired its hydrazine-fueled main engine at 0413 GMT (12:13 a.m. EDT) Friday and muscled off the launch pad at the Jiuquan space center in northwest China, powered by more than 650,000 pounds of thrust for the first two-and-a-half minutes of flight. Liftoff occurred at 12:13 p.m. Beijing time. The first stage engine gave way to the launcher's second stage to boost the mission's satellite passengers into orbit, where the payloads were released about 13 minutes after liftoff. The rocket was targeting a 422-mile-high sun-synchronous orbit optimized for imaging of Earth. The flight's prime objective was deploying the Gaofen 1 Earth observation satellite, a civil remote sensing satellite launched to help Chinese officials respond to disasters, survey natural resources, plot urban growth and support national security applications, according to the state-run Xinhua news agency. Gaofen 1 is the first of up to six similar remote sensing satellites planned for launch through 2015. Data from the Gaofen satellites will be used by civilian agencies within the Chinese government, including the Ministry of Land and Resources, the Ministry of Agriculture, and the Ministry of Environmental Protection, Xinhua reported. Gaofen means "high resolution" in Chinese. Moments after the Gaofen 1 satellite separated from the rocket, a cache of smaller passengers was supposed to be ejected into orbit. The secondary payloads included three CubeSats: Ecuador's first satellite, a spacecraft built by students in Turkey, and a technology demonstration platform from Argentina. The Ecuadorian satellite - named NEE-01 Pegasus - is outfitted with a camera to stream live video from orbit in partnership with EarthCam, a company which broadcasts views from cameras worldwide on the Internet. The CubeSat will also transmit data and audio messages to the ground. The cube-shaped satellite, measuring about 4 inches on each side, was developed by the Ecuadorian Civilian Space Agency, a non-profit, privately-funded organization set up in 2007. Ecuadorian President Rafael Correa watched the launch from a control center in Guayaquil, the country's largest city, and congratulated the space agency on the launch. Ronnie Nader, head of the space agency's space operations, tweeted: "Welcome to the sky, NEE-01 Pegasus. Welcome to space Ecuador." The toaster-sized Turksat-3USAT spacecraft was built in a joint effort between Turksat, Turkey's communications satellite operator, and the Istanbul Technical University. The satellite carries a transponder to communicate with amateur radio hobbyists. The CubeBug 1 satellite, sponsored by Argentina's Ministry of Science, Technology and Productive Innovation, will test custom-designed components in a small five-pound spacecraft, according to its builders.